Last weekend I took part in Smålandskavlen, the last big competition of the year. I ran the last leg, but the first two (night) runners didn't have a good day, and we were more than 15 minutes behind. Our 3 day runners did pretty well though, and I went out in 32nd place. I ran the whole race basically on my own, only seeing some other runners in the butterflies. I was happy with my race, I was about 3 minutes slower than the fastest on last leg, and I missed somewhere around 1-2 minutes, just a couple of small mistakes. My team finished 27th. Only bad thing is I hurt my calf a little, and then running on it on Monday, I managed to tear something, so now I can't run. This weekend I headed back to the UK for my fell running club's national relays champs, and my orienteering club's national team competition champs. I flew in on friday, and they lost my bag. 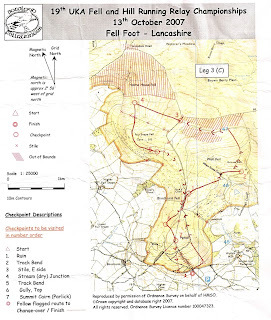 Saturday was the Fell Running Association Relay champs, and I was running for my club Mercia. With a full team, we were favourites to take the title after 2nd place 3 times in the last 4 years. Unfortunately we lost our 2 top runners to work and a broken arm. We still had a good team though, and finished 5th, but we were never in the hunt for a medal. Maybe next year. I ran a pretty good leg, running the pairs navigation leg. I was stronger than my partner, so I was pretty comfortable all the way, and doing the navigation, which was made more interesting by the low visibility. My bag turned up later that evening. 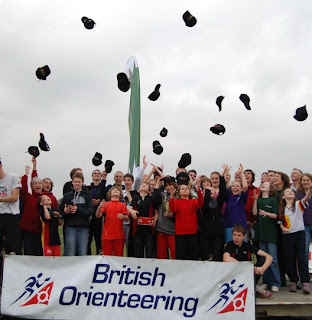 Sunday was the CompassSport Cup, the premier club team competition in Britain. 25 in a team, each run your own agegroup and score points which are added up. We (OD) had won for the last two years, and arguably had a stronger team than ever, but so did some other clubs. The race was hosted in Blidworth, which lived up to its poor reputation as a nasty brambly forest. 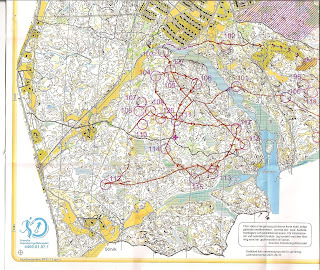 The map wasn't great, but the planner did a reasonable job of making a course with some interesting legs and route choices. I ran pretty well, felt strong, and won the race comfortably. 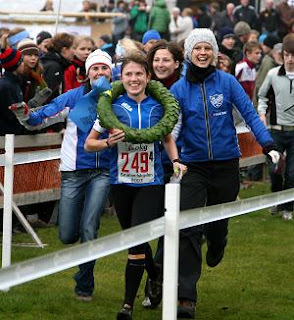 Liis won the women's course, and OD won overall for a hattrick of titles, which was nice. 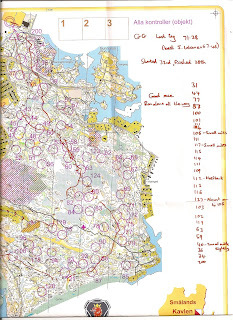 Results and route gadget etc here. My bag got lost on the way home too. The World Cup Final was held in Stein am Rhein, a Swiss town close to the German border. Virtually flat in Swiss terms, it still felt pretty hilly in the middle race, and I was struggling with a combination of lack of strength on the climbs, and not resting enough beforehand. 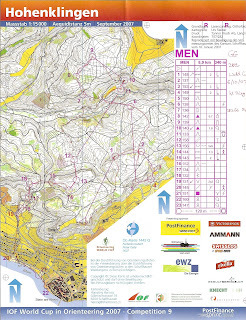 Without too many mistakes, I finished 28th, 7 minutes behind Thierry - some work to be done in this kind of terrain. 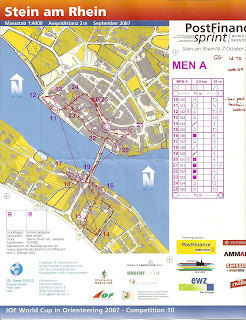 The sprint was in the town centre, and I knew it could potentially be very tricky, with a large number of controls, and my plan was to stay ahead of myself, and try and save the seconds at every opportunity. 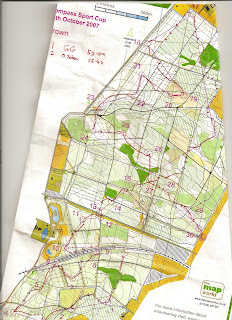 I started really well, and orienteered very cleanly around the first 9 controls. 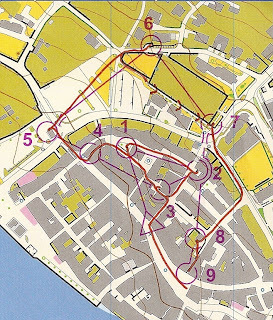 Then, when we came back into the arena, and had a map exchange, I failed to pick up what was going on immediately, and ran right past the 10th control, in the middle of the arena, within half a meter, and continued running down the street. I went 50m too far before I realised what was going on, and even when I came back it wasn't clear. After that I had an almost perfect run, losing a couple of seconds towards the end as I was getting tired, and we had some controls in little passage ways off the side of a larger road. Without my error, I would have been really happy with the result, but the loss of 25 seconds there turned my really good race into a bad race and an average result which I am not satisfied with. I take positives out of the fact that I was running fast enough for a really good result well inside the top 10. That control - after my race I thought it would be interesting to see how the women coped with the control in the arena, and I saw 2 runners run past and just miss it out, 4 or 5 run past and come back 30-60 seconds lates, and maybe another 5-10 stop and look really confused. I suspect that there was a similar phenomenon with the men, and I think that to have a control that so many runners have problems with is a little bit indicative that something could have been better. Having said that, the majority of the best runners didn't even miss a step, and had no problems tells the story that the rest of us should read the map a bit better. Back in Stockholm this week, before heading back to UK for a couple of races next weekend. First the FRA relays, then the CSC final.